In Spraymaq we have the best prices in sale of filters for painting booths or industrial filtration equipment. We advise you to contact us so that we give you all the information you need about our cartridge filters. 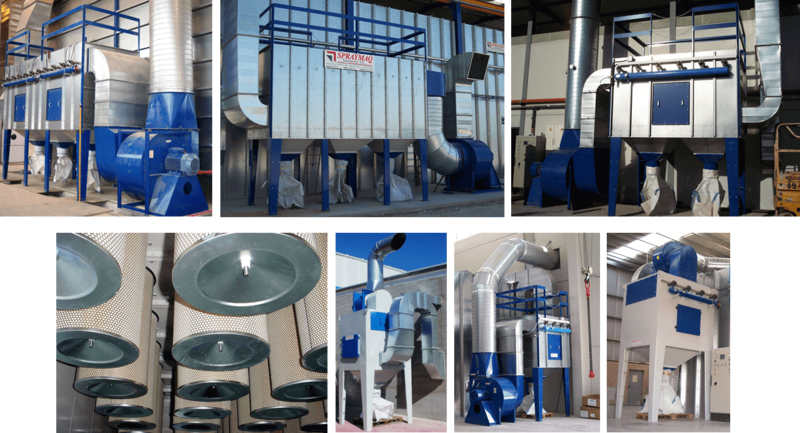 A wide range of motorized equipment, equipped with special filters for filtration of paint particles and elements, powder, metallization, et. Cartridge filters of modular panels of galvanized sheet metal, light and hermetic case conforming, mounted on hoppers and painted metal legs. Replacement cartridges and injectors is comfortably from the outside. The engine is located on the ground in such a way that vibrations or the weight can not damage the filter carrier. A programmable PLC, allows us to cycle control, stroke and depression, It also tells us electro performance anomalies and the saturation of filters. The filter Assembly is made up of two areas clean and dirty or lower upper. The dusty air is drawn in by the mouth of the lower, due to the depression created by the fan leads it through cartridges that filter the air, to the clean area, where is evacuated to the outside. The dust retained in the cartridge is cleaned and descaling filter element, using compressed air to back pressure that deposited it into the hopper of the bottom, from where it goes directly to a disposal bag. Filtration boxes fitted with filter blankets, cartridges, bags filters or charcoal filters that allow you to solve problems of recirculation, filtration, renovation and adaptation of facilities and work centers, meeting standards for quality and comfort. In Spraymaq you can find different kinds of cabins and facilities for its work. From sandblast booths up to painting and varnishing cabins, passing by cabins of metallic.